What is research and brainstorming? Why do we need it? Can’t you just take the creative brief and start doing stuff on the computer? After all, you have all the info from the client right? Wrong. The research and brainstorming stages will be the most time-consuming of all the steps that you have, if you do them right. But they will also be the most rewarding. Research involves various areas. You will usually research the specifics of the creative brief that the client filled out. Areas such as target, competition, likes and dislikes, etc.. These areas of research will help you better understand your client and who they’re marketing to, and what your design will be used for. You should research colors and their meanings that you will be considering for the client. Research can even be just talking to people in the target market and asking , to searching through ad campaigns the competitor may be running to visiting the client’s business as a “customer” to immerse yourself in the place of the audience. Once the step of research is done then you can start looking for a concept, or your big idea. You will discover your concept in the next step, the brainstorming. Often research and brainstorming will overlap, or you will go from research to brainstorming, then from brainstorming back to research. But generally the first place to start is the research, because it kind of guides where your brainstorming will go. I use something pretty specific for my brainstorming to get to a concept and to get to a place where I have a working start, something called a “mind map”. 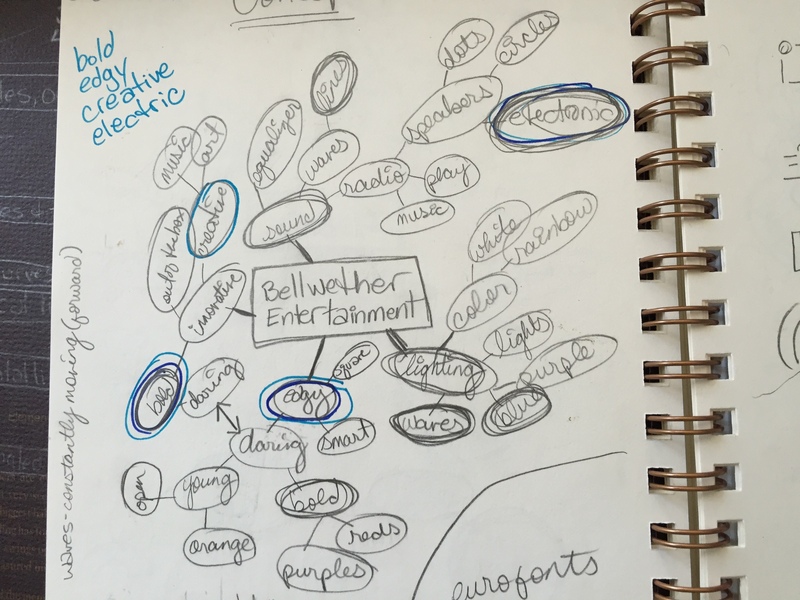 My secret weapon when it comes to brainstorming to find a concept, aesthetic, graphic element ideas, and even typeface styles, comes from something called a mind map or a web. This is where I “Use Words First” (or as Sean Wes says, “It all starts with writing.”) to begin ideating. This particular step is the most important for me because it gives me focused direction. I spend time reviewing the brief, then begin the research and brainstorming stage. I almost always discover my concept via the mind map and that concept is what will guide the entire project. A thesaurus can be your very best friend during this phase. You should start the web or the mind map is using one of the words that comes from the descriptive words on the brief that the client has given to you or put the name of the business in the center as your starting point and then from there branch off with the words from the client. If the client has not given you any words to work from, start with the first words that come to my mind when you think about the client. I don’t know if you took any writing classes where you were given the opportunity to “free write”. But, the idea is to write (on physical paper) for 15 minutes or so and not let your pen stop, just writing whatever comes to your mind. Brainstorming with the mind map is similar, you keep writing words that are related to the word that you wrote just before that until you fill a paper with all the words that are in your mind. The idea is to empty your mind of everything you can think of that would relate to the client and to those descriptive words even the ones that don’t seem to make sense. Below is an example of a mind map that I did for a client. After you write down all the words that you can think of that relate, then you look them over and circle the ones that seem to be the most pertinent to that client, and to your research–the ones that relate the best to the direction that you would like to take. This method almost always helps me find a creative concept direction for my clients. Using this process allows you to be able to explain where you got to your concept to your client and how it works, where the connections were made and how everything in your concept is connected. Many times it is even the primary avenue you can use to find the graphic elements, the shapes and the feelings that you want to use, or even colors for your design or logo. The brainstorming stage is where you will find a direction, find inspiration, and decide on the aesthetic of your design. Brainstorming for inspiration is another key portion of the brainstorming phase. I always do the mind map before I start searching for any fonts, graphics, or inspiration from other graphic designers. I do this because I want to make sure that I’m not just looking at a bunch of cool stuff without direction. If you’re just looking at a bunch of work, fonts, colors, without your concept in mind you will never stop looking for inspiration. However, if you have an idea or concept in mind you will find specific examples of things that you want your designed to look like, you will have the color scheme in mind, and you will be able to focus on a few select choices instead of hundreds. Here is the end result to my research and brainstorming for “Bellwether Entertainment”. The research and brainstorming steps of the design process are what will give you the confidence you need to own your ideas. You will be secure in all of your decisions when presenting to the client because you will know that you did the proper research. When you know you took the time with your brainstorming to make sure that all of the directions you took are connected, you will have reasons for everything you present. Research and brainstorming can take me anywhere from 2 to 10+ hours depending on the client. It’s the most draining and time-consuming of all of the steps, however, once I’ve done these steps, the subsequent steps go much quicker and much more smoothly. Research and brainstorming are like having the outline of a puzzle framed up in the beginning, finding the edges and corners. It doesn’t make the inside of the puzzle complete all on it’s own-you still have to work at the stuff in the center-but the pieces are easier to find and fit into place with a lot less effort if you do the work of finding the frame first. I’m happy to share my “secret weapon” with you. 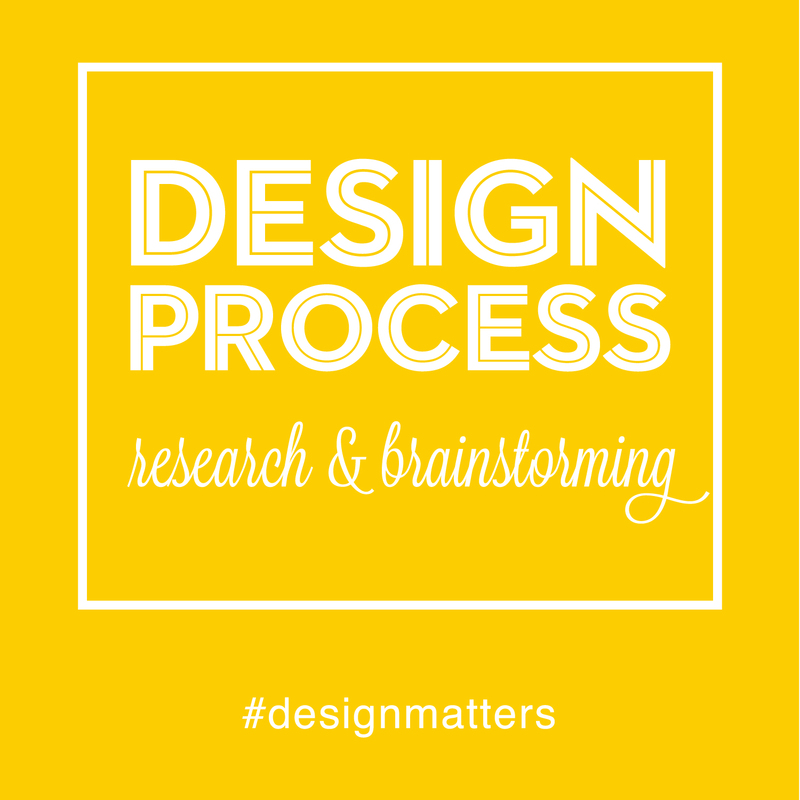 Research and brainstorming when done in this way, using this particular process can work wonders for your creative endeavors as a designer. I would love to know if you try this out, how it works for you. Stay tuned for next week. We will talk about the “Sketching” step in the process. Until then, remember, Design is a wonderful world. I hope you’ll join me here, because design matters.